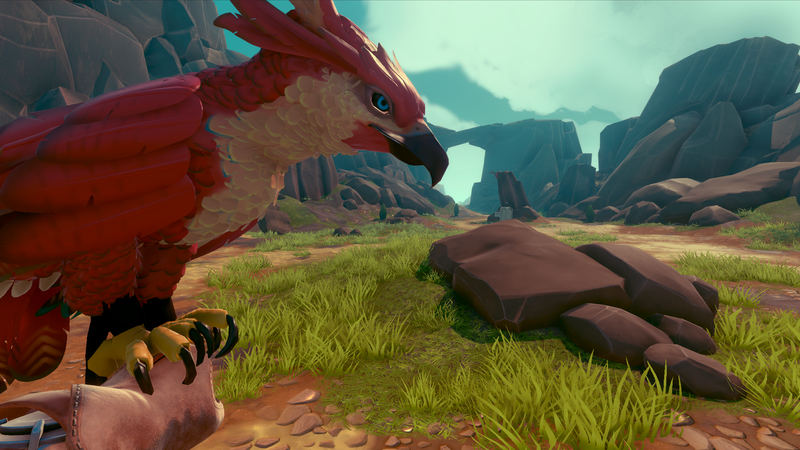 I was recently invited to a suite at GDC ’19 to chat with Chandana ‘Eka’ Ekanayake, Co-Founder and Studio Director for Outerloop Games, and to check out their upcoming PlayStation exclusive Falcon Age. The game doesn’t have a release date yet, but there’s a rumor that it’s date will be announced soon. The game now has a release date thanks to the State of Play stream. Big thanks to Eka for taking time out of a busy week to spend an hour with me discussing the game and VR in general. Falcon Age is a first-person, single-player action adventure game where you raise and control a falcon, wielding it as both a weapon and a hunter. The game starts on a dying colony planet with its culture destroyed, resourced depleted, and turned into a desert by machine invaders. Ara, our protagonist, has been wrongfully thrown in jail for a minor infraction. While she awaits her fate in a lonely cell, she passes the time by befriending and naming a young falcon. Together they escape and set off on an adventure to help the resistance reclaim their freedom and drive off the invaders. 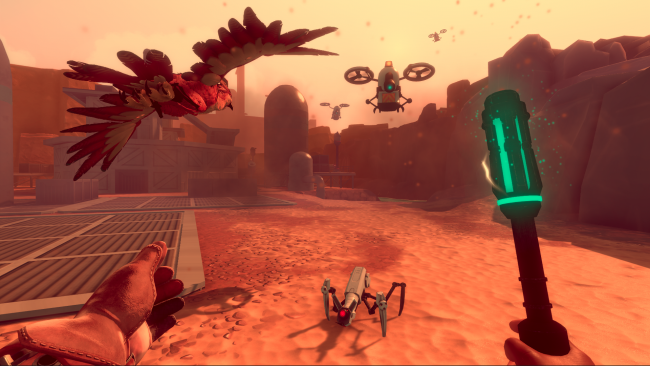 The game can be played as a standard PS4 game or as a VR game. VR mode supports either a PS4 controller or the more intuitive method of using two move controllers while the standard PS4 method just uses the controller. I was able to play the game in both modes, and it’s great either way, but your falcon really comes to life in VR. The interactions between yourself and your feathered friend are very precise and detailed to an extent I wasn’t expecting. You can not only see the feathers rippling at your touch, but you could almost feel the softness of them. 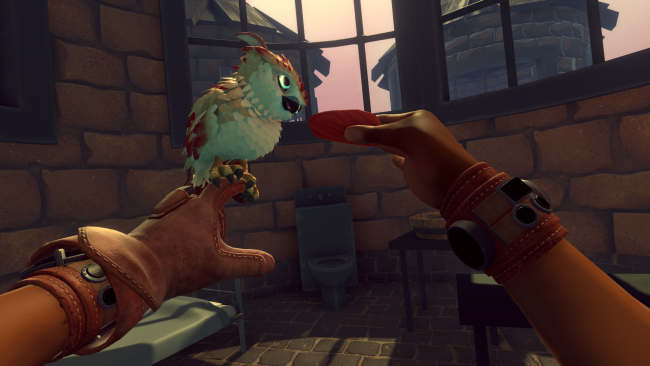 Developer Outerloop games didn’t just blindly go about making a game about falcons. They took the time to speak with multiple falconers to make sure they not only understood the interactions between the falconer and the falcon, but also how the falcon would act in a hunt and how it would take down its prey. While playing the game I targeted a small rabbit and ordered the falcon to attack it. As I watched, the bird flew down and grabbed the little cuddly animal, then proceeded to fly high up in the air and slammed the thing violently back down to Earth. It then proceeded to grab what was left and when I whistled, it returned a small piece of rabbit meat to me. Your falcon will also mantle over its dead prey on the ground if you approach it after a kill, just as it would in real life. The planet you are on also has robots that you’ll have to fight. Some can be taken down by the falcon while some may require you to work together. Your falcon can grab one of the bigger robots and reveal its weak point, momentarily giving you the opportunity to smash it and take it out. Without the falcon, taking out this particular robot is almost impossible. Some areas have anti-aircraft fire that can hurt your little buddy, so you’ll have to keep an eye on those as well. If your falcon is injured, you can heal with a combination of affection and snacks. It requires both to get it fully healed so just petting it or just feeding it isn’t enough. It’s an interesting concept that should help you stay bonded to your falcon on a more personal level. Like me, Eka occasionally has issues with movement and VR, so with that in mind they allowed two different methods to getting around in the game. One method has you strafing and moving around fluidly, but this method may cause some issues with motion sickness for those susceptible to that. The other method is a more direct point and click system where you point to a location and just teleport to it, and uses a twist of the move controller to help with the direction you want to face. This second method worked great for me while the first method left me a little queasy. Maybe it’s because I’m not a kid anymore, but movement and VR has a tendency to do that if I’m not 100% focused on an object. I started out in standard mode to better talk with Eka about his game but eventually strapped on the PSVR and gave it a go that way. Using the standard PS4 controller was easy enough, and required very little instruction, and the game functioned well, but it was in VR with the Move controllers that the game really felt at home. It utilizes the twisting, moving, and turning of the controllers nicely. With the falcon on your hand, if you lock eyes with him his head becomes stationary even if you move your arm around. It’s a cool effect that I haven’t seen used with VR before. 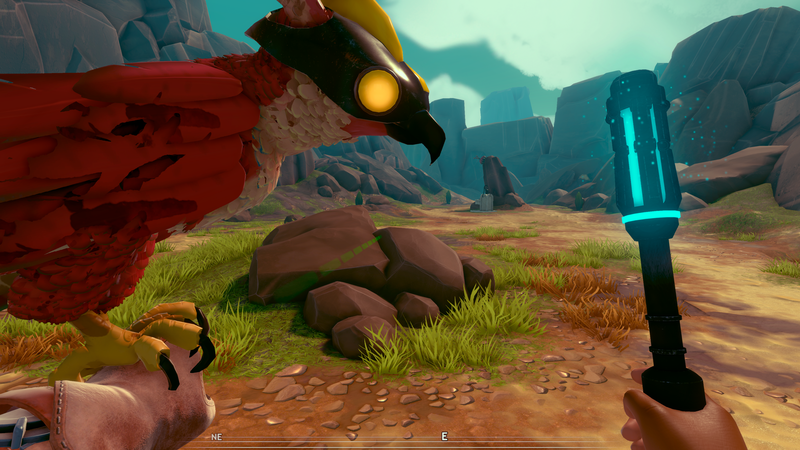 Developer Outerloop really went above and beyond to create Falcon Age and the demo I played really showed off their dedication to the title. With 4-6 hours of gameplay, and a Platinum trophy, this is shaping up to a must have title in your library.